Burgess Park in Southwark, South East London is fighting for a chance to get £2 million of London tax payers' money to help regenerate the park. Created on land which was heavily built up before the war, the park has never really been completed, and could benefit greatly from a boost to bring it closer to completion. In true web 2.0 fashion, Southwark Council are promoting this bid through YouTube, Facebook and Twitter. If you're in support of improving the area, you can back the Burgess Park bid by signing up to the Facebook group the council have set up. 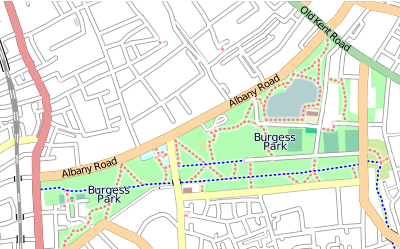 Map of Burgess Park based on data from OpenStreetMap, CC-by-SA. One of my favourite OSM tasks is to properly map parks, I spent a really pleasant afternoon cycling and walking around Burgess Park with my GPS but it really could do with this money! From the short time I've spent in the park so far, it looks like there's quite a bit of tidying up that could be done, clearing of rough areas, that sort of thing, and some lighting would be nice along the main track. Even some more information about the heritage of the area, like they have done with the lime kiln. I love that there is an open space like that so close though. I spent a really pleasant afternoon cycling and walking around Burgess Park with my GPS but it really could do with this money!